Tickets available locally at Diamond W Western Wear (E 2nd St), Blaze N J's (W9th St) and Fusion Pit (Anderson Outlets). 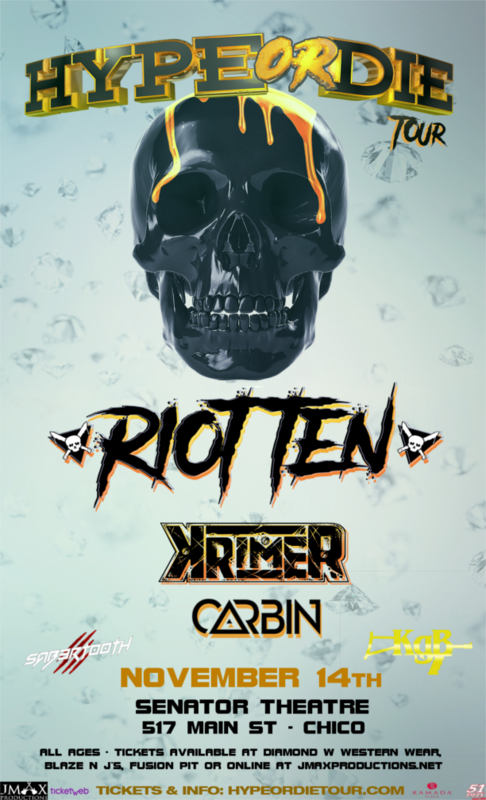 Born and raised in Texas, RIOT TEN, at the age of 22, exploded into the world of EDM with his unique blend of dubstep, electro and trap music. With music out on Dim Mak, Never Say Die, Rottun Recordings, and Buygore, and two #1 top 100 dubstep chart topping singles in 2017 alone, RIOT TEN's music can be heard at clubs and festivals around the world from the likes of DJ Snake, Excision, Zeds Dead, Porter Robinson, The Chainsmokers, Flux Pavilion, Nghtmre, and many more. His 2017 smash single "F**k It" saw #1 on the Beatport charts for over 5 weeks with a top 10 position that spanned nearly 3 months. This single became a staple on The Chainsmokers "Memories Do Not Open" world tour. His latest single "Rail Breaker", released by Steve Aoki's "Dim Mak Records", reached #1 on the charts and has yet to leave a top 10 position in over 2 months. Outside of the break out singles, Riot Ten's debut EP released in 2016 on 'Firepower Records' and he has since been off to the races. His 2017 "Rail Breaker World Tour" spanned 40 cities, sold out shows, including in Asia and Australia. His latest 8 track EP, which released in February on Dim Mak, made it's debut as a top 10 dance album on iTunes. In addition, he toured as support on over 55+ shows across North America on the "Ninja Nation 2018 Tour" to start the year. RIOT TEN is a sure fire bet to become one of the most sought out names in all of dance music, and this is only the beginning.